Plants with good safety performance often face a problem just because they haven’t suffered significant incidents for a long time. Complacency can develop, undermining the discipline required to maintain safety. We always must remember that safety is not a bankable commodity. Many processes include operations that take place at high temperatures or elevated pressures or that handle materials that pose flammability, toxicity or other hazards. So, keeping these operations safe is priority number one. 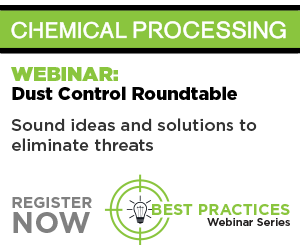 This on demand webinar will discuss how to achieve and maintain effective process safety. Tip: Scroll to the bottom of the registration page to see all the on-demand webinars, including this one. At sites where incidents have occurred, the lessons learned often are forgotten. “… History clearly shows that memory fades with time. Even when lessons learned are passed on — and let’s be honest, that doesn’t always happen — the passage of time leads to memory fade because people change and move on, the real details of the causes and of important factors like design intentions and limitations get forgotten or lost,” notes Judith Hackitt, chair of the U.K.’s Health and Safety Executive . Instilling an ongoing sense of unease requires conscientious and continual efforts. To begin with, all site personnel, from managers on down, should study hazard-and-operability and other risk evaluations for the plant to understand the potential dangers. Then, you must regularly remind staff of the type of incidents they could face if they don’t remain alert. 1. Take advantage of a contrite employee’s offers to help. I only have seen this once but it certainly is worth exploring if you have the right employees and correct safety culture. It could be honed into a very useful tool. The case I’m familiar with involved a dedicated process operator who worked within the cell room of a chlorine manufacturing plant. This conscientious employee was effective in everything he did. However, some years ago, as required for a brief correction, he cut the feed brine flow to an electrolyzer cell. As I recall the story, he got busy and failed to restore the feed brine. The protective instrumentation was limited and the electrical current heated the cell contents. An expensive explosion occurred but fortunately no one was injured. The operator was disciplined. The operator regretted the mishap and didn’t want anyone else ever to make such an error. So, he made a point to tell each new operator trainee his story and how to prevent a repeat. This is one very effective way to expose potential vulnerability. 2. Share investigation team case histories with all affected employees — and repeat in refresher training. When a serious incident with wide impact occurs within a complex, most organizations share the details with those in engineering, operations, maintenance and pertinent support groups. Many also share a near-miss that provides a learning opportunity. Often, however, the organization doesn’t have an effective way to repeat the message when new employees arrive or when veterans are reassigned. Those organizations with a good safety culture educate new faces about these incidents and repeat the learnings regularly as a refresher. Sharing these focused case histories increases the team’s sense of vulnerability. Strive to enhance the presentation of these local incidents with vivid photos or videos. Don’t bore employees with dry databases. 3. Post CCPS Process Safety Beacons on bulletin boards. Hopefully you already are familiar with the superb process-safety-awareness qualities of The Process Safety Beacon published by the Center for Chemical Process Safety (CCPS). Each installment, which is free, is a one-page lesson loaded with practical and sage guidance from a team of volunteer experts. The Beacon is downloadable in about 30 languages. Get a free subscription. 4. Show videos produced by the U.S. Chemical Safety Board. The U.S. Chemical Safety and Hazard Investigation Board (CSB) has developed more than four dozen videos to enhance safety in the process industries. Some of these videos are gut wrenching. All are well done — and are available free of charge. Presenting selected videos to all employees associated with those potential situations increases vulnerability awareness. One of the best all-around CSB videos is “An Anatomy of Disaster: Explosion at BP Texas City Refinery, March 28, 2005.” It tells the story of one of the worst industrial accidents in recent U.S. history in words, animation and site footage. This refinery explosion and fire that killed 15 workers, injured 180 others and resulted in billions of dollars in economic losses has been well studied and you need to hear the lessons. • Hazards of nitrogen asphyxiation. To see the roster of all videos, check: www.csb.gov/videos/. 5. Present and discuss “Spiral to Disaster.” A superb training video, “Spiral to Disaster” recreates the July 1988 Piper Alpha accident in the North Sea. This realistic documentary, which is about 30 minutes long, includes video of the fire and gas pipeline explosions taken from nearby ships . The catastrophe, the worst offshore oil-platform disaster ever, killed 167 people and incurred a financial loss of $1.8 billion, when adjusted to 2011 dollars, according to Marsh & McLennan . This well-produced video emphasizes management of change, permits to work, safety culture, disabling of safeguards, reluctance to shut down, communications during emergencies and other process safety issues. It underscores the repercussions of a poor safety culture and weak operating discipline. I suggest using this video in an interactive manner to instill the importance of a good safety culture. 6. Learn from another company’s experiences. Take advantage of BP’s “Sharing the Experience” booklets. These ready-to-use, image-rich practical process safety materials recount some of the company’s experiences over decades . Individuals who design, operate and maintain chemical plants and refineries should find the within-the-fence information and numerous supporting photos valuable. These superb booklets cover fundamentals that can supplement operator and mechanic awareness and training. They provide a wealth of case histories of hard-learned lessons. They certainly can increase the sense of vulnerability. • “Safe Tank Farm and (Un)loading Operations” (2008). They now are marketed by the Institution of Chemical Engineers as the “BP Process Safety Series” — see: www.icheme.org/bpsafetyseries. 7. Use the Internet to find current incidents and some from the past. In today’s world, search engines like Google can point you to plenty of information on recent fires or explosions and other incidents at chemical plant and refinery operations. National and international wire services often provide the more-frightening photos and more-focused stories. So, if time permits, each month perform an online search for “chemical plant explosion” or “petroleum refinery fire.” You likely will come up with either a good lesson or at least some fear-provoking industrial scenes. When searching for information on some of the major disasters that have befallen our industry, you may find short YouTube-type videos. However, for U.S. incidents later than 2001, first check the list of CSB videos because they are better produced and much more instructive. To get a sense of what’s available on major incidents, search “Reynosa Mexico Gas Explosion 2012,” a disaster that killed 26 people. You will find several sites featuring videos of a vapor cloud fire sweeping across the gas plant site as well as security camera footage of individuals on site attempting to run to safety. Entering the words “Buncefield Fire” brings up a listing of a number of videos from television news clips of a huge gasoline-storage-tank fire in Britain in December 2005. Similarly, searching for “Jaipur Refinery Tragedy” leads to news clips from English-speaking Indian news broadcasters about an October 2009 incident that was said to have killed 12 people. Plugging in the term “Venezuela Refinery Explosion 2012” provides links where you can see vivid photos of an horrific explosion that killed 45 or more people living near the site and destroyed plant equipment. Safteng.net functions as an exchange for vital training materials. Some PowerPoint lectures on various safety topics — such as lock or tag out, flammable liquids and personal protective equipment — are professionally prepared and ready to use. There also are numerous professionally prepared safety talks as well as hundreds of photos, including informative, shocking, gruesome and humorous ones. Clever use of some of these unique photos can spice up your presentations. You must become a member of the site to fully participate in the sharing of excellent safety information. Take advantage of the resources I’ve cited to develop a lively interactive process safety meeting to instill a sense of vulnerability in your organization. This article was developed from a chapter in the fourth edition of “Chemical Process Safety — Learning from Case Histories,” which was published in August. Besides numerous case histories that provide important lessons, the 486-page book covers topics such as mechanical integrity, management of change and incident investigation programs. For more information, go to: http://goo.gl/j8vk9u. ROY E. SANDERS is a process safety consultant based in Lake Charles, La. E-mail him at: sanders.roy@suddenlink.net. 1. Hackitt, J., “Process Safety — Focusing on What Really Matters,” keynote speech, Mary Kay O’Connor International Process Safety Symposium, College Station, Texas (Oct. 22, 2013), available online. 2. Kletz, T. A., “Bhopal Leaves a Lasting Legacy,” p. 14, Chemical Processing, Dec. 2009. 3. Hendershot, D. C., Herber, J. and King, G. M., “CCPS Process Safety Beacon: a Tool to Promote Process Safety Awareness for Front Line Plant Workers,” p. 405, Process Safety Progress, Vol. 30 (2011). 4. “Spiral to Disaster,” BBC Active (1997). 5. “The 100 Largest Losses 1972–2011,” p. 4, 22nd ed., Marsh & McLennan, New York City (2012). Available from: http://goo.gl/2isOSZ. 6. “Sharing the Experience,” BP Process Safety Series, booklets issued from 2004 to 2012 are available from the Institution of Chemical Engineers, Rugby. U.K. See: www.icheme.org/bpsafetyseries.